The Clean Air Make More app gives you real-time Phoenix air quality information and air pollution statistics right on your smartphone or tablet, providing air quality forecasts, air quality restrictions, and the ability to report a Phoenix air quality problem. Wondering how the air quality will affect your outdoor weekend plans? The app shows you both current air quality conditions as well as the forecast for several days out. Want to know whether it’s okay to burn wood in your fireplace or chiminea, use a leaf blower for landscape cleanup, or operate your off-highway vehicle? The app offers real-time updates on any restrictions on these activities. With detailed air pollution statistics on levels of ozone, carbon monoxide, PM-10 coarse particulates, and PM-2.5 fine particulates, it’s easy for people with asthma and other respiratory ailments to determine when extra caution outdoors is advisable. There’s even an option to report air quality violations and smoking vehicles, so you can do your part to help keep our air clean from the convenience of your mobile phone or device. 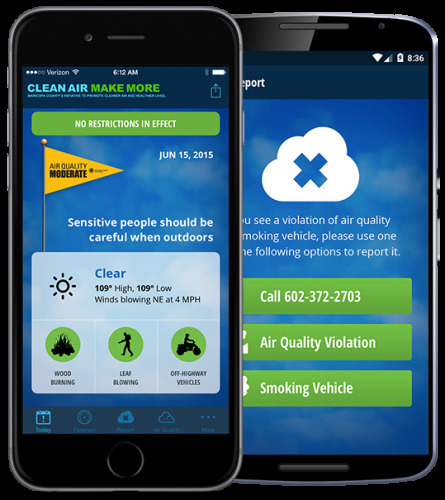 Download the Clean Air Make More mobile app today and always have the information right at your fingertips to educate yourself about Phoenix air quality and understand how to reduce air pollution in Maricopa County.